Pink and yellow goes great together, it just says spring to me. I like to glue in words, bits of articles and fitting (to my life) quotes. 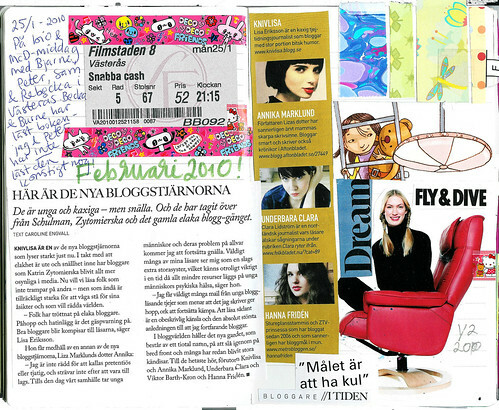 Swedish article about how bloggers now can be nice and write nice things… Gasp! 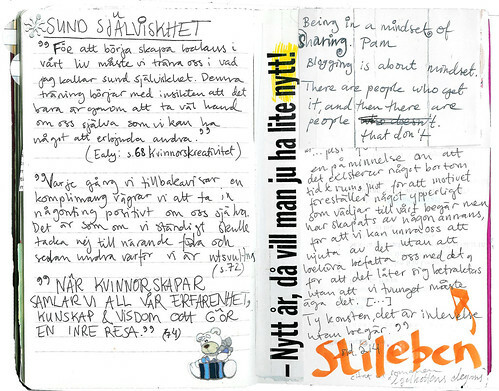 A few quotes collected, mostly from The Woman’s Book of Creativity by Diane Ealy that I’ve been reading (in Swedish). Love this book so much! 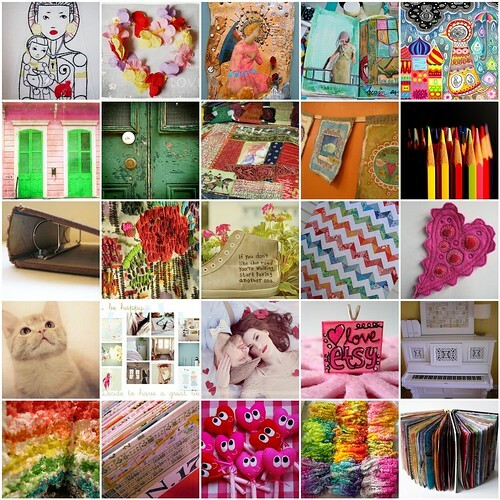 February is over, here is my inspiration mosaic for February. Pretty pretty images. Inspirational images collected on flickr and made into a mosaic. Bigger view. 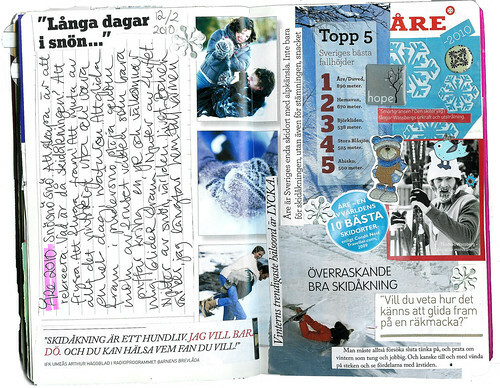 This entry was posted in Uncategorized and tagged diary collage, flickr mosaic, journaling. Bookmark the permalink. signing up for a journal making class today for Oct Art and Soul. Lynn, I’ve never taken a class like that – I envy you for having that possibility! You’re a lucky girl. I hope you’ll learn lots of fun new things. Who is the teacher? my mom would sew for me each year. I like how you move your writing around on the journal pages, keeps the visual interest going and the mosaic, so pink, love that. lovely, lovely! 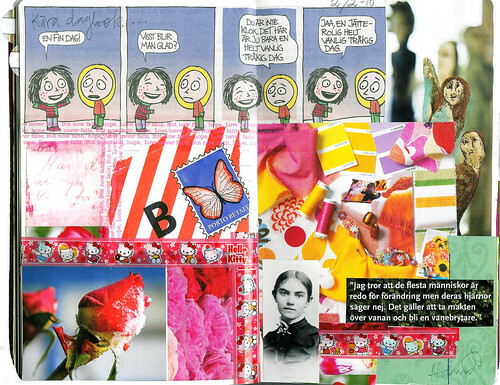 i always enjoy getting peeks into your journals.. so very inspiring ~ makes me want to go grab a glue stick and a magazine right now! This looks like such a fun journal/diary. I love the bright colors and all the clippings from magazines. Terrific idea! 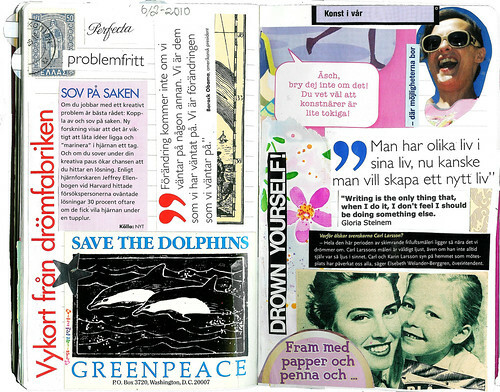 I like your creative diary collages – although I can not read them, but I can see. And I see your free and happy view of the world. Keep on being happy and colourful. Hi Hanna! Here is something to add to your diary, if you wish. I just mentioned you in my Doughnut Dreams blog post, as one of my sources for inspiration to pick up my paint brush again. It’s amazing to me, the connections, ideas and love that can be spread all over the world, just by typing on the computer. Thank you for sharing this very important part of your life, Hanna. It’s funny, I was just recently thinking about starting a creative journal/diary again. I really miss the interior and creative process of it. I used to write in a journal my entire high school & college years and, lately, I wondered why I stopped and that I should start doing this again. The article about “nice bloggers” made me smile as well. ;) We’re lucky that “un-nice” bloggers are a rarity in our community. I am excited to look at your blog/shop. Thanks for saying stopping by mine!